FREE APPRAISAL. To buy, auction, sell or consign your 1919 World Series ticket that is for sale, please email Nate@NateDSanders.com or call the Nate D. Sanders Auction House (http://www.NateDSanders.com) office at (310) 440-2982. The 1919 World Series is best remembered as the setting to the Chicago Black Sox scandal. After winning the American League pennant with a record of 88-52, the Chicago White Sox went on to lose the best of nine World Series to the Cincinnati Reds, five games to three. It was later believed that mob boss Arnold Rothstein played a hand in fixing the outcome as eight members of the White Sox were paid off to intentionally lose the World Series. After an investigation, these eight players went on to be banned for life from Major League Baseball by the newly appointed Commissioner of Baseball, Kenesaw Mountain Landis. The most controversial player banned is Shoeless Joe Jackson, who at the time was one of the best hitters in the league, and despite confessing to his involvement under oath, later went on to profess his innocence to no avail. The scandal was written about in the book “Eight Men Out” and was later adapted into the 1988 film of the same title, which stars John Cusack and Charlie Sheen. 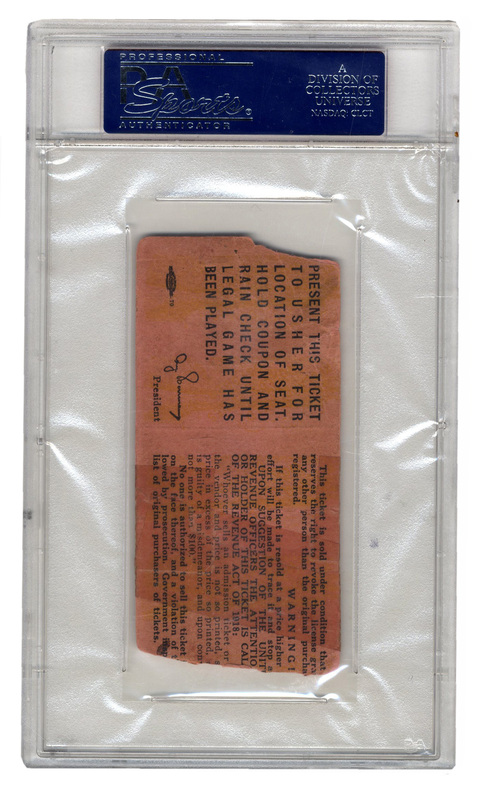 We have sold a 1919 World Series ticket at auction for $1,849. See below for details. One of a very few Cincinnati Reds ticket stubs from the infamous 1919 White Sox/Reds World Series “Black Sox Scandal,” where eight members of the Chicago White Sox franchise conspired to throw the World Series. 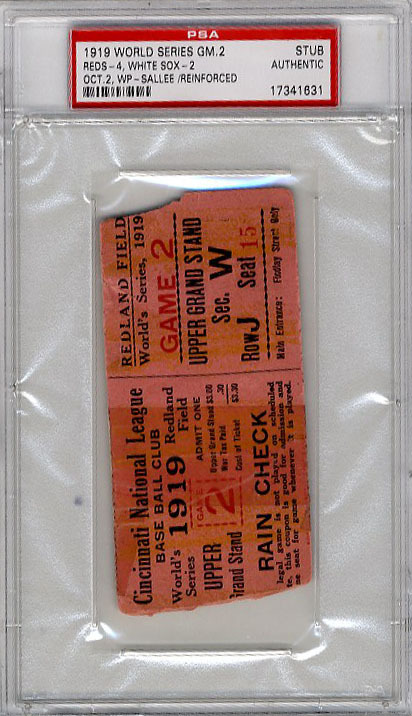 Ticket is from Game 2 of the Series, held at Redland Field in Cincinnati. Minor chipping to one edge and toning in spots, else very good condition. Encapsulated by PSA/DNA; there are only seven 1919 World Series Game 2 ticket stubs authenticated. Very rare. Sold for $1,849. 1919 Chicago White Sox/Cincinnati Reds World Series Ticket Stub. Click to enlarge.